Who wouldn't know this kid magazine? Even adults especially parents grab a copy of this for their children to enjoy. 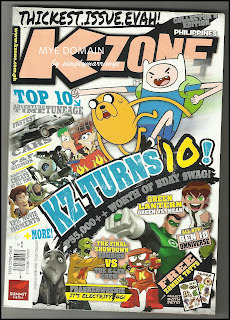 K-Zone is the biggest and most popular kids' magazine in the Philippines published by Summit Media. It caters to kids and young adults ages 8 to 16. They are called the K-Zoners who love bright, colorful and entertaining reads. KZ as it's commonly abbreviated, was first released in October 2002. It has Australian, New Zealand and Malaysian versions but the content of Philippine Edition is almost the same though it's more on gaming, anime, international and local celebrities. Almost every page is loaded with kids' stuff like newest cartoons, movies, latest gadgets, crafts, video games, wrestling, puzzles, comics, jokes and a lot of exciting but friendly and knowledgeable articles. K-Zoners love it because it kills their boredom, it makes them laugh and stimulates their sense of being young and free. Your Zone – Where the readers can send drawings, tweets, text message, and also online messages.Ultimate Showdown – Where readers or staff play a game or a challenge. Calendar – Where events, and birthday of celebrities and also the readers. KNN – A page of information relating places, events and other stuff. The Heat List – A top ten hits after or before the monthly issue. Tune in – contains episodes of cartoons, new release of cd albums, new release DVDs and new release book. Many other pages contains information about famous celebs, some trivia quizzes, popular sports stars and selected kids with exceptional skills and talents are being featured as well. My son, Kurt and my niece Dave got this unexpected opportunity to be included in the Kid On The Street page of KZ, October 2012 issue in which K-Zone happens to celebrate its 10th year. Congrats to your son and niece. I've seen the magazine a few times and its got really nice content for kids. I remember buying slash collecting(the most appropriate maybe) Kzone way back in my elementary years, wow 10 years now.. and that was 10 years ago, all the stuff on the mag we4re very helpful, HP days. Nostalgic on the good old days of childhood. Dati ,Niknok lang ang kinalakihan ng mga anak ko. Good to hear that Kids magazine still roams the market. Seems fully-loaded with stuff kids will surely love ang magazine. Soon, I will have my apo grab one copy. It's also nice that they let kids be part of the magazine as kids would appreciate the contents better if they are involved. Oh, nice mag for kids. My daughter also likes buying mags but nor for reading but for the toy that comes with it. Maybe next time I'll give in to her requests when she knows to appreciate reading one. For now, I prefer her to read fairy tale books. Wow, congratz to your son Kurt and niece Dave. We also wish to be feature in a magazine even for kids, Joke. First time to hear about K-ZONE. Thanks for sharing this with us. Now I know what magazine suitable to read for my kids. I remember this magazine when I was in high school where I bring back the times when animes are still beautiful, full of sense and u can get lessons in life. And also it keeps them updated for the latest kids shows and games available. Wow! It's already a decade old? That's so nice. Believe it or not, my little sister was featured on K-zone when she was still in grade school (during her first years as a basketball player). She's 19 now. I used to subscribe to K-zone when i was a kid! Congrats to the two kids :) Lucky! 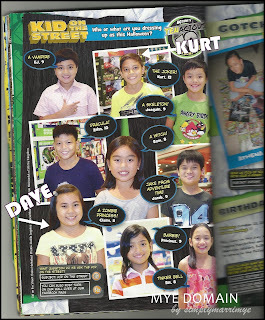 Not so familiar with K Zone jejeje:) For sure very interesting for kids ang content ng magazine. ahh...unfortunately I am one of the few who doesn't know about it haha, this is the first time I've seen it, looks like a fun mag for kids! Wow. 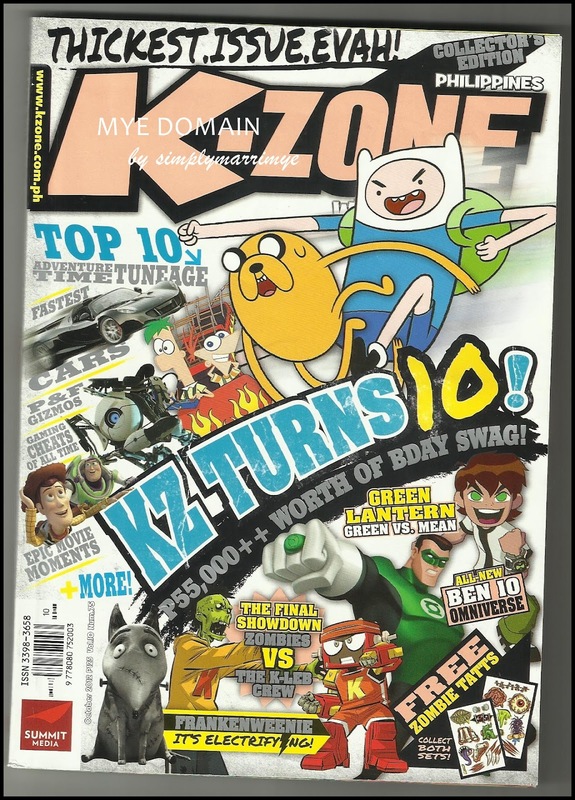 This K-Zone magazine turns 10? Time sure flies fast. Congratulations! For some reason, I don't seem to remember reading this one when I was a kid. Different 'trip' I guess. My son has all, as in ALL, Kzone issues :) He's a big fan! I regularly see this mag in bookstores :) Congrats kiddos! nice! frame it!!! I'd love to get a copy!!! i remember reading saving my allowance for a week just to buy a k-zone magazine..
Congrats to your son and niece. It's an exciting opportunity for the kids to be on their favorite mag.